Zeke’s has been a block or so from our newsroom during my entire Bulletin tenure, but it took me a while to get there, the name Zeke’s Eatin’ Place being kind of an eye-roller. I had a decent breakfast there a few years ago, which raised my opinion of the restaurant, and promptly forgot the whole thing. For a recent breakfast meeting with three Ontario cops, they picked Zeke’s, a longtime favorite of the department, at least its older members. I was happy to give the place a try in the company of some admirers. It’s breakfast and lunch only, closing at 3 p.m., and the motif is Wild West, with John Wayne and Clint Eastwood portraits, lots of wood and the deepest booths I’ve ever seen, able to fit six, or maybe eight. The menu has a hokey story about a fictional miner named Zeke, which is sort of charming, actually. Imagine, a diner with a concept that’s more 1850s than 1950s. Biscuits and gravy are a specialty, but that’s not my thing. 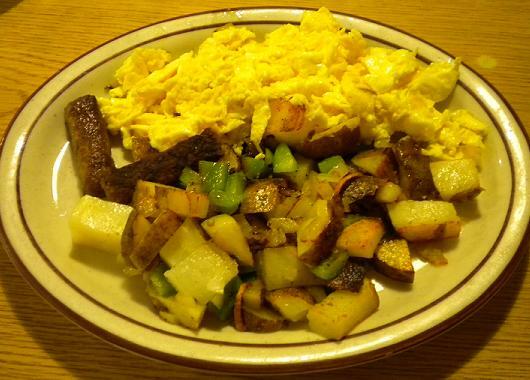 I had two eggs, sausage links and home fries ($6.15); others had the breakfast sandwich ($5.79), chicken fried steak and home fries ($7.35) and, for the cop with a cast-iron stomach, the chili cheese onion omelet ($8.09). Everybody pronounced themselves pleased, although I would warn you away from the sausages, dinky things that looked fresh from the supermarket freezer. 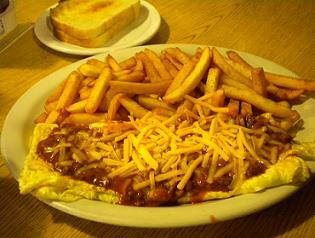 Zeke’s is known for its wagon wheel-size pancakes. As stated here about Guasti Homestyle Cafe, I’m not a “big breakfast” guy, but if you are, Zeke’s portions should satisfy you. Besides, it’s a homey place. 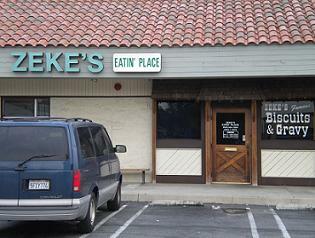 The cops told me Zeke’s has been around since the early 1980s, beginning in the shopping plaza at 4th and Grove before moving a few blocks east to 4th and Vineyard in the 1990s. Lunchtime sandwich offerings on the menu made me think I should hit them up, so I’ve since returned for a meatloaf sandwich. It was only okay, but the fries were above average, and the service was friendly. The waitress even called me sweetheart a few times. You gotta love that. Zeke’s isn’t spectacular, but it’s a nice regular-folks place. This entry was posted in Restaurants: Ontario by David Allen. Bookmark the permalink. Hi David! Seems like you’re from Fontana/Rancho Cucamonga area? I have never tried Zeke but it seems like their food looks super good! I live in Los Angeles area near by downtown L.A and I love Chinese food (well, because I’m Chinese LOL). If you have a craving for Chinese food, I would recommend you to drive down to San Gabriel area where is all populated by Chinese restaurants. Go to China Bistro if you have a chance, their food is great! Hi David, would sure like to know what happened to the restaurant “Home Kitchen” in Pomona on Foothill Blvd. near Garey Ave. Had lunch there a few weeks ago, went by there last week, and it’s empty, closed, sign taken off the front, no notice on the doors, just empty!! Sure would like to know why. They had a fire, and from what I heard, the landlord wouldn’t give them a break from the rent while they rebuilt. They used to own JoAnn’s Cafe, but I believe they still have one in Glendora.